Each year the Trustees of the Social Security and Medicare trust funds report on the current and projected financial status of the two programs. This message summarizes the 2014 Annual Reports. Neither Medicare nor Social Security can sustain projected long-run program costs in full under currently scheduled financing, and legislative changes are necessary to avoid disruptive consequences for beneficiaries and taxpayers. If lawmakers take action sooner rather than later, more options and more time will be available to phase in changes so that the public has adequate time to prepare. Earlier action will also help elected officials minimize adverse impacts on vulnerable populations, including lower-income workers and people already dependent on program benefits. Social Security and Medicare together accounted for 41 percent of Federal expenditures in fiscal year 2013. The general revenue transfers into SMI and interest payments made to the trust funds are resulting in mounting pressure on the unified budget, as will the eventual decline in the level of total reserves held by the Social Security and HI Trust Funds. Both programs will experience cost growth substantially in excess of GDP growth through the mid-2030s due to rapid population aging caused by the large baby-boom generation entering retirement and lower-birth-rate generations entering employment and, in the case of Medicare, to growth in expenditures per beneficiary exceeding growth in per capita GDP. In later years, projected costs expressed as a share of GDP trend up slowly for Medicare and are relatively flat for Social Security, reflecting slower growth in per-beneficiary health care costs and very gradual population aging caused by increasing longevity. Social Securitys Disability Insurance (DI) program satisfies neither the Trustees long-range test of close actuarial balance nor their short-range test of financial adequacy and faces the most immediate financing shortfall of any of the separate trust funds. DI Trust Fund reserves expressed as a percent of annual cost (the trust fund ratio) declined to 62 percent at the beginning of 2014, and the Trustees project trust fund depletion late in 2016, the same year projected in the last Trustees Report. DI costs have exceeded non-interest income since 2005 and the trust fund ratio has declined in every year since peaking in 2003. While legislation is needed to address all of Social Securitys financial imbalances, the need has become most urgent with respect to the programs disability insurance component. Lawmakers need to act soon to avoid automatic reductions in payments to DI beneficiaries in late 2016. To summarize overall Social Security finances, the Trustees have traditionally emphasized the financial status of the theoretical combined trust funds for DI and for Old Age and Survivors Insurance (OASI). The combined trust funds, and expenditures that can be financed in the context of the combined trust funds, are theoretical constructs because there is no legal authority to finance one programs expenditures with the other programs taxes or reserves. Social Securitys total expenditures have exceeded non-interest income of its combined trust funds since 2010 and the Trustees estimate that Social Security cost will exceed non-interest income throughout the 75-year projection period. The Trustees project that this annual cash-flow deficit will average about $77 billion between 2014 and 2018 before rising steeply as income growth slows to its sustainable trend rate after the economic recovery is complete while the number of beneficiaries continues to grow at a substantially faster rate than the number of covered workers. Redemption of trust fund asset reserves from the General Fund of the Treasury will provide the resources needed to offset Social Securitys annual aggregate cash-flow deficits. Since the cash-flow deficit will be less than interest earnings through 2019, reserves of the combined trust funds will continue to grow but not by enough to prevent the ratio of reserves to one years projected cost (the combined trust fund ratio) from declining. (This ratio peaked in 2008, declined through 2013, and is expected to decline steadily in future years.) After 2019, Treasury will redeem trust fund asset reserves to the extent that program cost exceeds tax revenue and interest earnings until depletion of combined trust fund reserves in 2033, the same year projected in last years Trustees Report. Thereafter, tax income would be sufficient to pay about three-quarters of scheduled benefits through the end of the projection period in 2088. Under current projections, the annual cost of Social Security benefits expressed as a share of workers taxable earnings will grow rapidly from 11.3 percent in 2007, the last pre-recession year, to roughly 17.1 percent in 2037, and will then decline slightly before slowly increasing after 2050. Costs display a slightly different pattern when expressed as a share of GDP. Program costs equaled 4.1 percent of GDP in 2007, and the Trustees project these costs will increase to 6.2 percent of GDP for 2037, then decline to about 6.0 percent of GDP by 2050, and thereafter rise slowly reaching 6.1 percent by 2088. The projected 75-year actuarial deficit for the combined Old-Age and Survivors Insurance and Disability Insurance (OASDI) Trust Funds is 2.88 percent of taxable payroll, up from 2.72 percent projected in last years report. This deficit amounts to 22 percent of program non-interest income or 17 percent of program cost. A 0.06 percentage point increase in the OASDI actuarial deficit would have been expected if nothing had changed other than the one-year extension of the valuation period to 2088. The effects of recently enacted legislation, updated demographic and economic data, and improved methodologies on net worsened the actuarial deficit by 0.10 percent of taxable payroll. While the theoretical combined OASDI Trust Fund fails the long-range test of close actuarial balance, it does satisfy the test for short-range (10-year) financial adequacy. The Trustees project that the combined trust fund asset reserves at he beginning of each year will exceed that years projected cost through 2027. The Trustees project that the Medicare Hospital Insurance (HI) Trust Fund will be the next to face depletion after the DI Trust Fund. The projected date of HI Trust Fund depletion is 2030, four years later than projected in last years report. At that time dedicated revenues will be sufficient to pay 85 percent of HI costs. The Trustees project that the share of HI cost that can be financed with HI dedicated revenues will decline slowly to 75 percent in 2047, and will then stay about flat. HI non-interest income less HI expenditures is projected to be negative this year (as it has been in every year since 2008), and then turn positive for six years (2015-2020) before turning negative again in 2021. The projected HI Trust Funds long-term actuarial imbalance is smaller than that of the combined Social Security trust funds under the assumptions employed in this report. The estimated 75-year actuarial deficit in the HI Trust Fund is 0.87 percent of taxable payroll, down from 1.11 percent projected in last years report. The HI fund again fails the test of short-range financial adequacy, as its trust fund ratio is already below 100 percent and is expected to decline continuously until reserve depletion in 2030. The fund also continues to fail the long-range test of close actuarial balance. The HI 75-year actuarial imbalance amounts to 23 percent of tax receipts or 19 percent of program cost. The improvement in the outlook for HI long-term finances is principally due to lower-than-expected spending in 2013 for most HI service categories, which reduced the base period expenditure level about 1.5 percent and contributed to the Trustees decision to reduce projected near-term spending growth trends. Taken together, these changes lowered the actuarial deficit by about 0.29 percent of taxable payroll. Other changes resulted in an increase in the actuarial deficit of 0.05 percent. Unlike in past years, the Medicare Part B cost projection featured in this report and summarized below (the projected baseline) assumes that reductions in Medicare payment rates for physician services called for by the Sustainable Growth Rate (SGR) formula will be overridden in the future as they have been from January 2003 through March 2015. Specifically, the projected baseline assumes that physician payment rates will remain at their current levels through the end of 2015, and will then rise at the same rate currently slated for the 10-year period ending March 31, 2015 (0.6 percent annually) through 2023. Relative to the current-law projection featured in the 2013 report, this change in the conceptual basis for the baseline projection raises the growth rate of projected Part B costs by about 0.3 percentage points on average over the next 75 years. While legislation overriding physician fee reductions has in recent years included provisions offsetting the 10-year cost of the overrides, the division of those offsets between Medicare savings and savings in other parts of the budget has varied. Because it is difficult to anticipate the extent to which policy makers will finance future overrides with other Medicare savings, the Medicare projected baseline does not include any offsets. This projection represents neither a legislative prediction nor a policy recommendation by the Trustees. The Trustees project that Part B of Supplementary Medical Insurance (SMI), which pays doctors bills and other outpatient expenses, and Part D of SMI, which provides access to prescription drug coverage, will remain adequately financed into the indefinite future because current law automatically provides financing each year to meet the next years expected costs. However, the aging population and rising health care costs cause SMI projected costs to grow steadily from 1.9 percent of GDP in 2013 to approximately 3.3 percent of GDP in 2035, and then more slowly to 4.5 percent of GDP by 2088. General revenues will finance roughly three-quarters of these costs, and premiums paid by beneficiaries almost all of the remaining quarter. SMI also receives a small amount of financing from special payments by States and from fees on manufacturers and importers of brand-name prescription drugs. In recent years U.S. national health expenditure (NHE) growth has slowed relative to historical patterns. There is uncertainty regarding the extent to which this slowdown in the rate of cost growth reflects one-time effects of the recent economic downturn and other non-persistent factors or structural changes in the health care sector that may produce additional cost savings in the years ahead. The Trustees are hopeful that U.S. health care practices are in the process of becoming more efficient as providers anticipate a future in which the rapid cost growth rates of previous decades, in both the public and private sectors, do not return. Indeed, the Trustees have revised down their projections for near-term Medicare expenditure growth in response to the recent favorable experience. In addition, the methodology for projecting Medicare finances had already assumed a substantial long-term reduction in per capita health expenditure growth rates relative to historical experience, to which the Affordable Care Acts cost-reduction provisions would add substantial further savings. Notwithstanding recent favorable developments, both the projected baseline and current law projections indicate that Medicare still faces a substantial financial shortfall that will need to be addressed with further legislation. Such legislation should be enacted sooner rather than later to minimize the impact on beneficiaries, providers, and taxpayers. The most immediate financing challenge facing any of the trust funds is the projected depletion of the Social Security Disability Insurance (DI) Trust Fund in late 2016. For Social Security as a whole as well as Medicare, projected long-range costs are not sustainable with currently scheduled financing and will require legislative action to avoid disruptive consequences for beneficiaries and taxpayers. If lawmakers act sooner rather than later, they can consider a wider array of options and more time will be available to phase in the changes, giving the public adequate time to prepare. Earlier action would also provide more opportunity to ameliorate any adverse impacts on vulnerable populations, including lower-income workers and people already significantly dependent on program benefits. What Are the Trust Funds? Congress established trust funds managed by the Secretary of the Treasury to account for Social Security and Medicare income and disbursements. The Treasury credits Social Security and Medicare taxes, premiums, and other income to the funds. There are four separate trust funds. For Social Security, the Old-Age and Survivors Insurance (OASI) Trust Fund pays retirement and survivors benefits and the DI Trust Fund pays disability benefits. (OASDI is the designation for the two trust funds when they are considered on a theoretical combined basis.) For Medicare, the Hospital Insurance (HI) Trust Fund pays for inpatient hospital and related care. The Supplementary Medical Insurance (SMI) Trust Fund comprises two separate accounts: Part B, which pays for physician and outpatient services, and Part D, which covers the prescription drug benefit. In 2013, 47.0 million people received OASI benefits, 11.0 million received DI benefits, and 52.3 million were covered under Medicare. The only disbursements permitted from the funds are benefit payments and administrative costs. Federal law requires that all excess funds be invested in interest-bearing securities backed by the full faith and credit of the United States. The Department of the Treasury currently invests all program revenues in special non-marketable securities of the U.S. Government which earn a market rate of interest. The balances in the trust funds, which represent the accumulated value, including interest, of all prior program annual surpluses and deficits, provide automatic authority to pay benefits. What Were the Trust Fund Results in 2013? A summary of trust fund operations is shown in the following table. The OASI and SMI Trust Funds showed a net increase in asset reserves in 2013; reserves in the DI and HI Trust Funds declined. The following table shows payments, by category, from each trust fund in 2013. Trust fund income, by source, in 2013 is shown below. In 2013, Social Securitys cost continued to exceed the combined programs tax income and also continued to exceed its non-interest income, a situation that the Trustees project to continue throughout the long-range period (2014-88) and beyond. The 2013 deficit of tax income (Table 3, first two lines) relative to cost was $76 billion. In 2013, the HI fund used $9 billion of interest income (Table 3) and $15 billion of asset reserves (Table 1) to finance expenditures beyond those that could have been made solely on the basis of tax and premium income. For SMI, transfers from the General Fund of the Treasury, which are set prospectively based on projected costs, represent the largest source of income. Part B spending was lower than anticipated in 2013 resulting in an $8 billion increase in account asset reserves (Table 1). What is the Outlook for Future Social Security and Medicare Costs in Relation to GDP? One instructive way to view the projected costs of Social Security and Medicare is to compare the costs of scheduled benefits and administrative costs for the programs with the gross domestic product (GDP), the most frequently used measure of the total output of the U.S. economy (Chart A). Under the intermediate assumptions employed in the reports and throughout this Summary, costs for the programs increase substantially through 2035 when measured this way because: (1) the number of beneficiaries rises rapidly as the baby-boom generation retires; and (2) the lower birth rates that have persisted since the baby boom cause slower growth of the labor force and GDP. Social Securitys projected annual cost increases to about 6.2 percent of GDP by 2035, declines to 6.0 percent by 2050, and remains between 6.0 and 6.1 percent of GDP through 2088. Under the projected baseline,, 1 Medicare cost rises to 5.4 percent of GDP by 2035, largely due to the rapid growth in the number of beneficiaries, and then to 6.9 percent in 2088, with growth in health care cost per beneficiary becoming the larger factor later in the valuation period. In 2013, the combined cost of the Social Security and Medicare programs equaled 8.4 percent of GDP. The Trustees project an increase to 11.5 percent of GDP in 2035 and 13.0 percent of GDP by 2088. Although Medicare cost (3.5 percent of GDP) was smaller than Social Security cost (4.9 percent of GDP) in 2013, the gap closes gradually until 2052, when Medicare is projected to be the more costly program. During the final decade of the long-range projection period, Medicare is about 12 percent more costly than Social Security. The projected costs for OASDI and HI depicted in Chart A and elsewhere in this document reflect the full cost of scheduled current-law benefits without regard to whether the trust funds will have sufficient resources to meet these obligations. Current law precludes payment of any benefits beyond the amount that can be financed by the trust funds, that is, from annual income and trust fund reserves. In years after trust fund depletion, the amount of benefits that would be payable is lower than shown, as described later in this summary, because benefit cost exceeds annual income. In addition, the projected costs assume realization of the full estimated savings of the Affordable Care Act. As described in the Medicare Trustees Report, the projections for HI and SMI Part B depend significantly on the sustained effectiveness of various current-law cost-saving measuresin particular, the lower increases in Medicare payment rates to most categories of health care providersand assume that SGR physician payment reductions scheduled under current law will be overridden. What is the Outlook for Future Social Security and Medicare HI Costs and Income in Relation to Taxable Earnings? Since the primary source of income for OASDI and HI is the payroll tax, it is informative to express the programs incomes and costs as percentages of taxable payrollthat is, of the base of worker earnings taxed to support each program (Chart B). 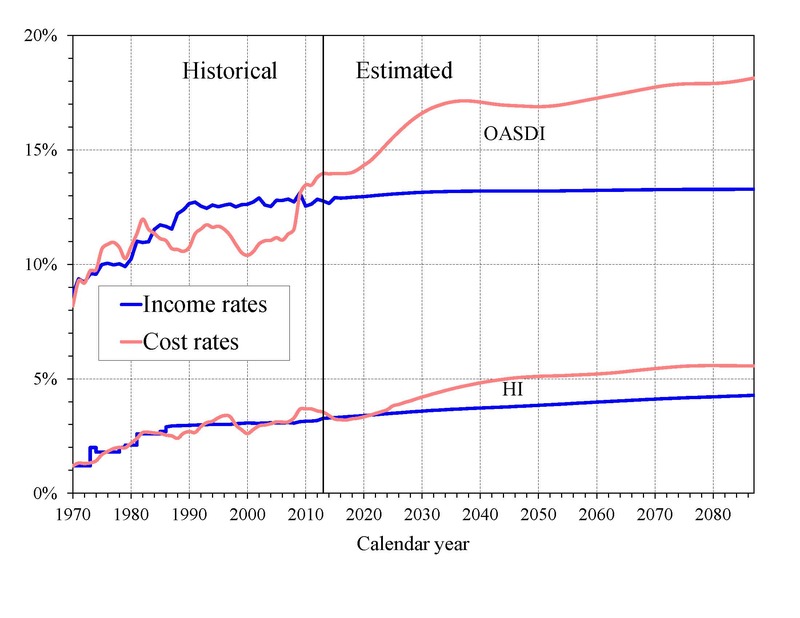 Both the OASDI and HI annual cost rates rise over the long run from their 2013 levels (13.97 and 3.55 percent). Projected Social Security cost grows to 17.14 percent of taxable payroll by 2037, declines to 16.89 percent in 2050, and then rises gradually to 18.19 percent in 2088. The projected Medicare HI cost rate rises to 5.11 percent of taxable payroll in 2050, and thereafter increases to 5.56 percent in 2088. HI taxable payroll is almost 25 percent larger than that of OASDI because the HI payroll tax is imposed on all earnings while OASDI taxes apply only to earnings up to an annual maximum ($117,000 in 2014). The OASDI income ratewhich includes scheduled payroll taxes at the current 12.4 percent level, taxes on benefits, and any other transfers of revenues to the trust funds excepting interest paymentswas 12.77 percent in 2013 and increases slowly over time, reaching 13.29 percent in 2088. Annual income from the taxation of OASDI benefits will increase radually relative to taxable payroll as a greater proportion of Social Security benefits is subject to taxation in future years, but will continue to be a relatively small component of program income. The HI income ratewhich includes payroll taxes and taxes on OASDI benefits, but excludes interest paymentsrises gradually from 3.28 percent in 2013 to 4.29 percent in 2088 due to the Affordable Care Acts increase in payroll tax rates for high earners that began in 2013. Individual tax return filers with earnings above $200,000, and joint return filers with earnings above $250,000, pay an additional 0.9 percent tax on earnings above these earnings thresholds. An increasing fraction of all earnings will be subject to the higher tax rate over time because the thresholds are not indexed. How Will Cost Growth in the Different Parts of Medicare Change the Sources of Program Financing? As Medicare cost grows over time, general revenue and beneficiary premiums will play an increasing role in financing the program. Chart C shows scheduled cost and non-interest revenue sources under the projected baseline for HI and SMI combined as a percentage of GDP. The total cost line is the same as displayed in Chart A and shows Medicare cost rising to 6.9 percent of GDP by 2088. Projected revenue from payroll taxes and taxes on OASDI benefits credited to the HI Trust Fund increases from 1.4 percent of GDP in 2014 to 1.8 percent in 2088 under the projected baseline, while projected general revenue transfers to the SMI Trust Fund increase from 1.4 percent of GDP in 2014 to 3.3 percent in 2088, and beneficiary premiums increase from 0.5 to 1.2 percent of GDP. The share of total non-interest Medicare income from taxes falls substantially (from 41 percent to 28 percent) while general revenue transfers rises (from 43 to 52 percent), as does the share of premiums (from 14 percent to 18 percent). The distribution of financing changes in part because in Parts B and Dthe Medicare components that are financed largely from general revenuescosts increase at a faster rate than Part A cost under the Trustees projections. By 2088, the projected HI deficit represents 0.5 percent of GDP and there is no provision under current law to finance that shortfall through general revenue transfers or any other revenue source. The Medicare Modernization Act (2003) requires that the Board of Trustees determine each year whether the annual difference between program cost and dedicated revenues (the bottom four layers of Chart C) under current law exceeds 45 percent of total Medicare cost in any of the first seven fiscal years of the 75-year projection period, in which case the annual Trustees Report must include a determination of excess general revenue Medicare funding. The Trustees made that determination every year from 2006 through 2013, but because the difference between program cost and dedicated revenues is not expected to exceed the 45 percent threshold during fiscal years 2014-20, there is no such determination in this years report. In 2014, the projected difference between Social Securitys expenditures and dedicated tax income is $80 billion. For HI, the projected difference between expenditures and dedicated tax and premium income is $25 billion. 3 The projected general revenue demands of SMI are $248 billion. Thus, the total General Fund requirements for Social Security and Medicare in 2014 are $352 billion, or 2.0 percent of GDP. Redemption of trust fund bonds, interest paid on those bonds, and transfers from the General Fund provide no new net income to the Treasury, which must finance these payments through some combination of increased taxation, reductions in other government spending, or additional borrowing from the public. 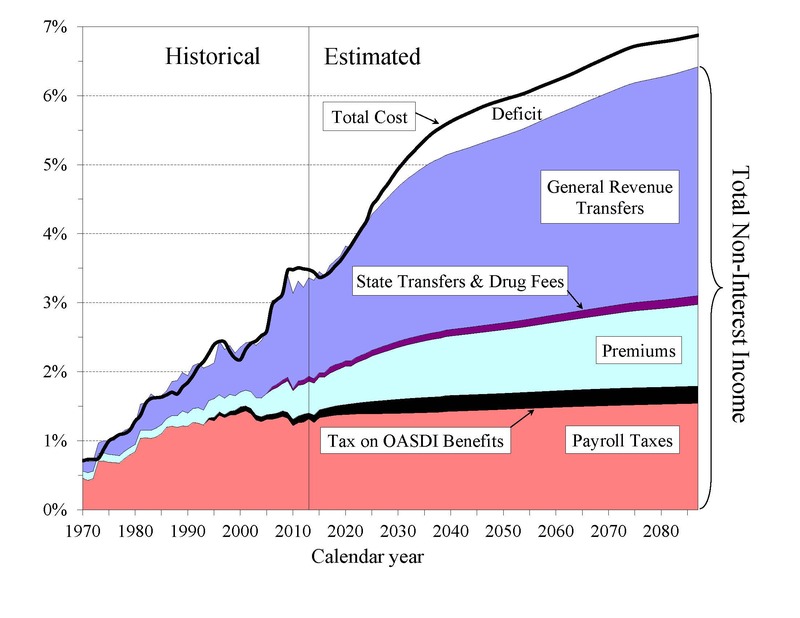 Chart D shows that the difference between cost and revenue (expressed as a percentage of GDP) from dedicated payroll taxes, income taxation of benefits, and premiums will grow rapidly through the 2030s as the babyboom generation reaches retirement age, under the assumption that scheduled benefits will be paid even in the absence of an increase in dedicated tax revenues. 4 This imbalance would result in vastly increasing pressure on the unified Federal budget, with such financing requirements equaling 4.4 percent of GDP by 2040. What Is the Outlook for Short-Term Trust Fund Adequacy? The reports measure the short-range adequacy of the OASI, DI, and HI Trust Funds by comparing fund asset reserves at the start of a year to projected costs for the ensuing year (the trust fund ratio). A trust fund ratio of 100 percent or morethat is, asset reserves at least equal to projected cost for the yearis a good indicator of a funds short-range adequacy. That level of projected reserves for any year suggests that even if cost exceeds income, the trust fund reserves, combined with annual tax revenues, would be sufficient to pay full benefits for several years. By this measure, the OASI Trust Fund is financially adequate throughout the 2014-23 period, but the DI Trust Fund fails the short-range test because its trust fund ratio was 62 percent at the beginning of 2014, with projected depletion of all reserves in late 2016. The HI Trust Fund also does not meet the short-range test of financial adequacy; its trust fund ratio was 76 percent at the beginning of 2014 based on the years anticipated expenditures, and the projected ratio does not rise to 100 percent within five years. Projected HI Trust Fund asset reserves become fully depleted in 2030. Chart E shows the trust fund ratios through 2040 under the intermediate assumptions. The Trustees apply a less stringent annual contingency reserve test to SMI Part B asset reserves because (i) the financing for that account is set each year to meet expected costs, and (ii) the overwhelming portion of the financing for that account consists of general revenue contributions and beneficiary premiums, which were 73 percent and 25 percent of total Part B income in calendar year 2013. Part D premiums paid by enrollees and the amounts apportioned from the General Fund of the Treasury are determined each year. Moreover, flexible appropriation authority typically established by lawmakers for Part D allows additional General Fund financing if costs are higher than anticipated, limiting the need for a contingency reserve in that account. a Column entries represent key dates for the hypothetical combined OASI and DI funds. b Dates pertain to the post-2000 period. 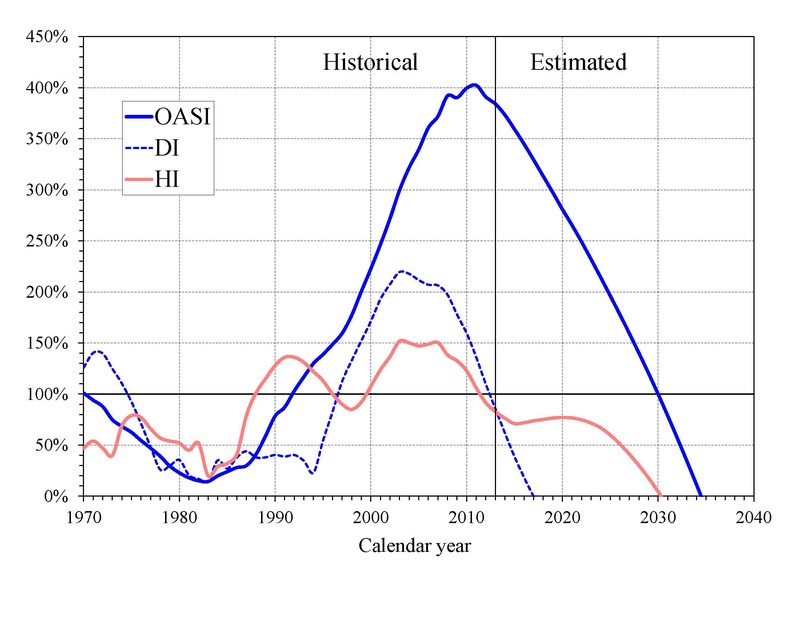 c Dates indicate the first year that a condition is projected to occur and to persist annually thereafter through 2088. DI Trust Fund asset reserves, which have been declining since 2008, are projected to be fully depleted in 2016, as reported last year. Payment of full DI benefits beyond 2016, when tax income would cover only 81 percent of scheduled benefits, will require legislation to address the financial imbalance. Lawmakers may consider responding to the impending DI Trust Fund reserve depletion, as they did in 1994, solely by reallocating the payroll tax rate between OASI and DI. Such a response might serve to delay DI reforms and much needed financial corrections for OASDI as a whole. However, enactment of a more permanent solution could include a tax reallocation in the short run. The OASI Trust Fund, when considered separately, has a projected reserve depletion date of 2034, one year earlier than in last years report. 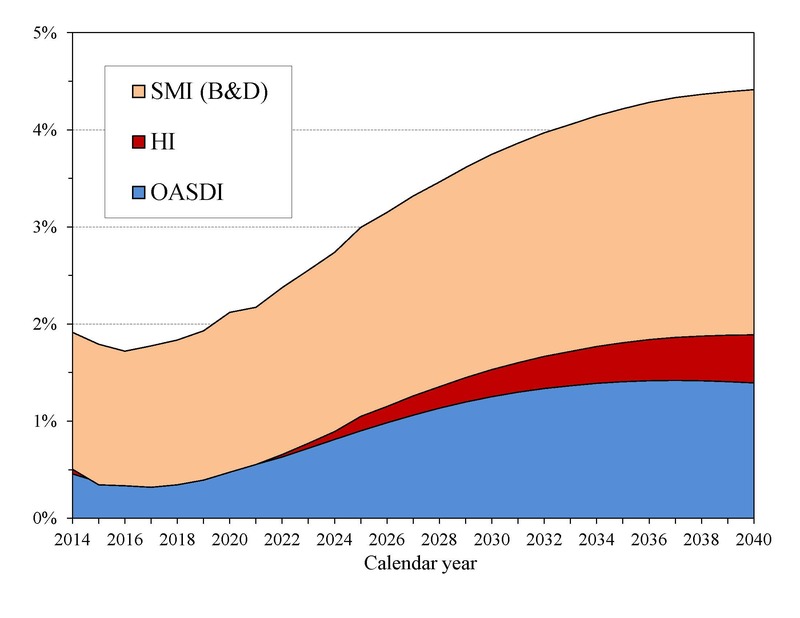 The theoretical combined OASDI trust funds have a projected depletion date of 2033, unchanged from last years report. After the depletion of reserves, continuing tax income would be sufficient to pay 77 percent of scheduled benefits in 2033 and 72 percent in 2088. The OASDI reserves are projected to grow in 2014 because anticipated interest earnings ($99 billion in 2014) still substantially exceed the non-interest income deficit. This years report indicates that annual OASDI income, including payments of interest to the trust funds from the General Fund, will exceed annual cost every year until 2020, increasing the nominal value of combined OASDI trust fund asset reserves. The trust fund ratio (the ratio of projected reserves to annual cost) will continue to decline gradually (Chart E), as it has since 2008, despite this nominal balance increase. Beginning in 2020, net redemptions of trust fund asset reserves with General Fund payments will be required until projected depletion of these reserves in 2033. The projected HI Trust Fund depletion date is 2030, four years later than reported last year. Under current law, scheduled HI tax and premium income would be sufficient to pay 85 percent of estimated HI cost in 2030 and 77 percent by 2088. This report anticipates that in 2014 the HI Trust Funds non-interest income deficit ($22 billion) will exceed projected interest earnings ($8 billion), requiring the use of $14 billion in asset reserves. Non-interest income is projected to exceed cost for 2015 through 2020 as the economic recovery continues, followed by increasing annual shortfalls of non-interest income through the remainder of the long-range projection period. What is the Long-Range Actuarial Balance of the OASI, DI, and HI Trust Funds? Another way to view the outlook for payroll tax-financed trust funds (OASI, DI, and HI) is to consider their actuarial balances for the 75-year valuation period. The actuarial balance measure includes the trust fund asset reserves at the beginning of the period, an ending fund balance equal to the 76th years costs, and projected costs and income during the valuation period, all expressed as a percentage of taxable payroll for the 75-year projection period. Actuarial balance is not an informative concept for the SMI program because Federal law sets premium increases and general revenue transfers at the levels necessary to bring SMI into annual balance. The Trustees project that the annual deficits for Social Security as a whole, expressed as the difference between the cost rate and income rate for a particular year, will decline from 1.29 percent of taxable payroll in 2014 to 1.06 percent in 2017 before increasing steadily to 3.95 percent in 2037. Annual deficits then decline slightly through 2050 before resuming an upward trajectory and reaching 4.90 percent in 2088 (Chart B). The relatively large annual variations in deficits indicate that a single tax rate increase for all years starting in 2014 sufficient to achieve actuarial balance would result in sizable annual surpluses early in the period followed by increasing deficits in later years. Sustained solvency would require payroll tax rate increases or benefit reductions (or a combination thereof) by the end of the period that are substantially larger than those needed on average for this reports long-range period (2014-88). The Trustees project that the HI cost rate will exceed the income rate in 2014 by 0.11 percent of taxable payroll, followed by a period of small tax-income surpluses in 2015 through 2021. Deficits subsequently re-emerge to grow rapidly with the aging of the baby boom population through about 2045, when the annual deficit reaches 1.23 percent of taxable payroll. After 2050, the annual deficits level off through 2088 at approximately 1.30 percent of taxable payroll. How Has the Financial Outlook for Social Security and Medicare Changed Since Last Year? Under the intermediate assumptions, the combined OASDI trust funds have a projected 75-year actuarial deficit equal to 2.88 percent of taxable payroll, 0.16 percentage point larger than last years estimate. The anticipated depletion date for the theoretical combined asset reserves remains 2033. The actuarial deficit increased by about 0.06 percent of payroll due to advancing the valuation date by one year and including the year 2088. The remaining increase in the deficit is due primarily to changes in methods, assumptions, and starting values. Medicares HI Trust Fund has a long-range actuarial deficit equal to 0.87 percent of taxable payroll under the intermediate assumptions, 0.24 percentage point smaller than reported last year. This improvement is primarily due to lower projected spending for most HI service categoriesespecially for inpatient hospitalsthat reflects lower-than-expected spending in the projection base year (2013) and other recent data, lower utilization assumptions for inpatient hospitals, and lower case mix assumptions for skilled nursing facilities and home health agencies. The projected date of depletion of the HI Trust Fund is now 2030, four years later than reported last year. The Affordable Care Act applies an additional HI tax equal to 0.9 percent of earnings over $200,000 for individual tax return filers, and on earnings over $250,000 for joint return filers. In 2014, the Part B standard monthly premium is $104.90. There are also income-related premium surcharges for Part B beneficiaries whose modified adjusted gross income exceeds a specified threshold. In 2014 through 2019, the threshold is $85,000 for individual tax return filers and $170,000 for joint return filers. Income-related premiums range from $146.90 to $335.70 per month in 2014. In 2014, the Part D base monthly premium is $32.42. Actual premium amounts charged to Part D beneficiaries depend on the specific plan they have selected and average around $31 for standard coverage. Part D enrollees with incomes exceeding the thresholds established for Part B must pay income-related monthly adjustment amounts in addition to their normal plan premium. For 2014, the adjustments range from $12.10 to $69.30 per month. Part D also receives payments from States that partially compensate for the Federal assumption of Medicaid responsibilities for prescription drug costs for individuals eligible for both Medicare and Medicaid. In 2014, State payments will cover about 10 percent of Part D costs. 1 Recent Medicare Trustees Reports featured current-law projected costs which incorporated scheduled reductions in physician payment rates under the sustainable growth rate (SGR) formula. The reports noted that those reductions were unlikely to occur and warned readers that, therefore, projected costs for Part B were probably understated. This years report (and this Summary) gives primary emphasis to the projected baseline, in which it is assumed that SGR reductions are overridden by Congress, as has occurred in every year since 2003. 2 As noted earlier in this summary, if trust fund depletion actually occurred as projected for HI in 2030 and for OASDI in 2033, each program could pay benefits thereafter only up to the amount of continuing dedicated revenues. Chart D, by contrast, compares dedicated sources of tax and premium income with the full cost of paying scheduled benefits under each program. In practice, lawmakers have never allowed the asset reserves of the Social Security or Medicare HI trust funds to become depleted. 4 As previously noted, this scenario would require a change in law to allow for the timely payment of all scheduled benefits upon trust fund depletion. 5 HI results in this section of the Summary are on a cash rather than the incurred expenditures basis. For the past several years, the annual Trustees Reports have warned lawmakers and the public of the financing shortfalls facing the Social Security and Medicare programs, emphasizing that continued delay in legislating corrective measures is likely to make the challenge ever more difficult to resolve and result in undesirable consequences. Notwithstanding the enactment of the Affordable Care Act (ACA) in 2010 and the recent slowdown in the growth of national health expenditure (NHE) and Medicare spending, further legislative changes will be required to ensure Medicares financial sustainability. While Social Security has not been the object of significant financing reforms since 1983, its need for additional measures has been recognized for over two decades. Now, in the middle of the second decade of the 21st century, the adverse consequences of delaying necessary corrections in both programs are beginning to be realized. The most immediate financing threat facing either program is the impending depletion of Social Security Disability Insurance (DI) Trust Fund reserves in late 2016. This is the closest that any of the separate trust funds has come to depletion in over two decades. The major component of the solution to the last reserve depletion crisis, enacted in 1994, was to reallocate payroll taxes from the Old-Age and Survivors Insurance (OASI) Trust Fund to the DI Trust Fund. This response reflected the fact that, at that time, the DI Trust Fund faced both a more immediate and relatively larger shortfall than did the OASI Trust Fund. The present situation is very different from that of 1994. 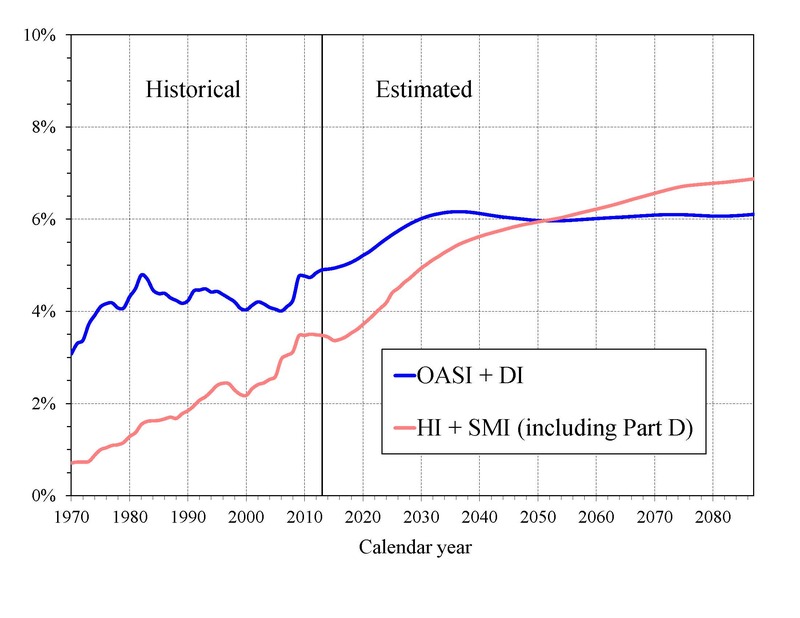 While there are administrative issues and policy concerns unique to DI, the DI funds currently projected depletion is, to a great extent, related to financing pressures that afflict both the OASI and DI Trust Funds. Of the two funds, OASI faces the larger long-term imbalance between income and obligations. The earlier depletion date of the DI Trust Funds reserves largely reflects the fact that the baby boomers have been aging through the years of high disability incidence before reaching the ages at which they are eligible for OASI benefits. As baby boomers receiving DI benefits reach Social Securitys full retirement age, the costs of their benefits shift from DI to OASI, increasing costs for the latter trust fund. The DI Trust Funds impending reserve depletion signals that the time has arrived for reforms that strengthen the financing outlooks for OASI and DI alike. The urgency of addressing the financial challenges facing both programs is underscored by the fact that the financing shortfall in the theoretical combined Social Security trust funds has now grown to a size substantially greater, even relative to todays larger economy, than the shortfall corrected in the landmark bipartisan Social Security amendments of 1983. Those reforms, which included a six-month delay in cost-of-living adjustments, exposing benefits to income taxation for the first time, requiring new Federal employees to join the system and pay payroll taxes, raising the age of eligibility for full retirement benefits, accelerating a previously scheduled payroll tax increase, and other measures, were intensely controversial and difficult to enact. It is sobering to consider that financing corrections today would require more significant measures than those. Furthermore, the longer corrective action is put off, the more severe the measures will have to be and the fewer the cohorts who can be asked shoulder a portion of the burden. Unless Social Securitys historical financing structure is to be altered to finance some or all of the program from the Federal governments General Fund on a permanent basis, and thereby weaken the historical tie between individual contributions and benefits, legislators must act to eliminate this financing shortfall. This task becomes progressively more difficult, and therefore less assured of success, with each passing year. Long before the reserves of the OASI and HI Trust Funds are depleted, the finances of Social Security and Medicare will be challenging because of the growing pressure these programs exert on the Federal budget. This is a central concern from the standpoint of program financing because the reserves of each of the various trust funds are invested wholly in U.S. Treasury securities. Monitoring interactions between the trust funds and the General Fund is one of our core duties. When lawmakers created the public trustee positions in 1983 pursuant to a recommendation of the Greenspan Commission, that commission made its recommendation to create public trustees in the investment procedures section of its report, rather than in those sections pertaining to actuarial balance. While the Greenspan Commission presented different opinions on the issue of whether Social Security should be included within the unified Federal budget, members of the commission agreed that it was important that Social Securitys impact on the budget be laid out in a transparent fashion. The minority advocated for Social Securitys impact thereon to be seen more clearly while the majoritys arguments included making clear the effect and presence of any payments from the General Fund of the Treasury to the Social Security program. Indeed, our public trustee positions exist in large part because of lawmakers concern that the economic and fiscal implications of the trust funds buildup and drawdown be fully understood and properly managed. One of the first actions taken by the programs original two public trustees in 1985, the year of their first report, was to direct a study of these implications in response to the concerns. Resources for Social Security and Medicare trust fund interest payments, asset redemptions, and other General Fund paymentsmost notably those for SMImust be found in competition with other spending and borrowing within the unified Federal budget, while Federal lawmakers maintain the ability to change the programs benefit and tax schedules as warranted by broader fiscal considerations. Accordingly, a thorough assessment of the degree of risk associated with scheduled benefit payments cannot be limited solely to assessing the level of reserves present in the trust funds, but also requires cognizance of the degree of pressure such payments will place on other components of the Federal budget. The rising cost of Medicare has long strained the Federal budget largely because the preponderance of Medicare SMI expenditures is financed from the General Fund. Pressure arising from increasing Social Security expenditures attained a new significance when program costs began to exceed incoming tax revenue in 2010. In 2013, these programs costs together required $357 billion (2.1 percent of GDP) from the General Fund. Whether one regards the Medicare financing challenge to be more or less serious than Social Securitys depends on the perspective taken. Of the two programs, Social Security has the larger actuarial imbalance and the reserves of one of its two trust funds (DI) are in more imminent danger of depletion. On the other hand, Medicares long-term cost growth is still projected to exceed Social Securitys, and its operations stand to place greater strain on the Federal budget. As with Social Security, legislative actions of a significant magnitude will be required to place Medicare on a sound financial footing. Upon the release of last years Trustees Report, and in the months afterward, questions arose as to whether a recent slowdown in national health expenditure growth may indicate less urgency in legislating Medicare financing corrections than suggested by our intermediate projections. Unfortunately, this is not the case. The Trustees projections have long assumed that over the long term NHE growth will slow relative to historical trends. Overlaying the ACAs required reductions in Medicare reimbursement rates on top of this projection methodology means that in the later decades of our long-range valuation period (2014-88) we project that per capita spending growth in many categories of Medicare payments will slow markedly relative to per capita GDP growth. Clearly it is to be hoped that NHE growth will continue to slow and that cost-saving mechanisms in current law will prove effective and sustainable. However, even with the assumption of decelerating spending growth Medicares financing shortfall, like Social Securitys, remains a reality warranting legislative corrections. With this, our fourth annual reports as Public Trustees, we are once again pleased to vouch for the integrity of the process by which the Trustees projections are developed. We appreciate the dedication and skill of the capable staff that the ex officio Trustees have assigned to help develop these reports and the sophisticated analysis that lies behind the projections. While unanticipated economic and demographic developments and legislative changes will mean that actual results will differ from these projections, we believe the Trustees deliberation process is one fully deserving of public confidence.